Melbourne is a small city of about 80,000 people in southern Brevard County on Florida's Space Coast about one hour east of Orlando. The "new" Melbourne of today has two distinct "old" and renovated downtown areas: historic downtown Melbourne and Olde Eau Gallie, each with lots of restaurants and shops. 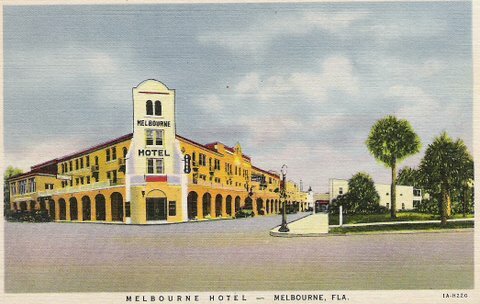 The old Melbourne Hotel shown on the postcard below still stands on US-1 and is used today as an office building. The Melbourne city limits take in a large area of beach along the Atlantic Ocean and miles of shoreline on the Indian River Lagoon. Other towns in the Melbourne area are Palm Bay, Melbourne Beach, Indialantic, Satellite Beach, and Indian Harbor Beach. The large residential development communities of Suntree and Viera are in the north region of Melbourne. The entire area has abundant shopping, dining, drinking, and recreational resources. The city gets its name from Melbourne, Australia. The area began to be called Melbourne eight years before the town was officially established. A name was needed because a post office was being established to serve families in the area. The first postmaster, Cornthwaite John Hector, was an Englishman who spent much of his life in Melbourne, Australia, before opening a general store at Crane Creek. A local pioneer, Mrs. R. W. Goode, suggested the post office be named Melbourne. The area began to thrive in the late 1800's because of its advantageous location on the Indian River Lagoon. Farmers in the area had easy access to a good port and economic transport of their produce to profitable markets. An interesting local character was Peter Wright, a black freedman (a slave freed during the Civil War) who became known as the "Sailing Mailman". 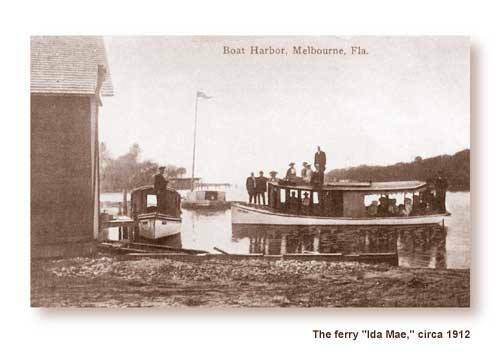 Wright sailed a regular schedule from Titusville to Malabar to deliver mail to the numerous riverside settlements. Melbourne prospered along Crane Creek where it empties into the Indian River, and its fortunes were linked to Eau Gallie, another small town north of Melbourne with a nice port on the Indian River. One of the interesting buildings still standing in Melbourne from the early days is the ice plant. It was originally a power generating plant that also produced ice. It is on US Highway 1 near downtown Melbourne, and is on the National Register of Historic Places. Eau Gallie was settled by William Gleason and his friends. Gleason had earlier done a lot of development in the Miami area, and was prominent in state and national politics. 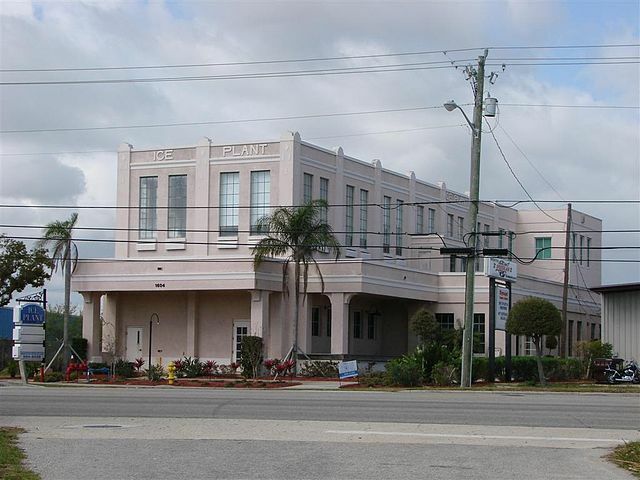 The railroad came to Eau Gallie and Melbourne in 1893, and the focus of commerce moved from the Indian River to the tracks on the higher land to the west. In 1969, local voters consolidated Melbourne and Eau Gallie into one city and picked the name Melbourne for the new venture. Some wanted it to be named Eau Gallie; others wanted Melbogallie and any other variety of compromise names. We are all grateful that the name Melbourne won out. The edge of historic downtown Melbourne Florida near the Indian River was the location of the "Trysting Stairs, a wooden stairway leading up a bluff at the north end of Front Street. The stairs provided a convenient way to reach residences on the higher ground above and became an informal meeting place which was especially popular among young lovers at the time. Pineda Crossing is one of the reasons I miss living in Brevard County. Its address says Roberts Road, but it is really on the west side of U.S.-1 just south of the Pineda Causeway in the Palm Shores area north of Melbourne between Suntree, Viera and Rockledge. The menu is loaded with mostly delicious American favorites like seafood and steaks, with a few exotic specialties like Jambalaya and Blue Crab Bisque thrown in for delightful measure. 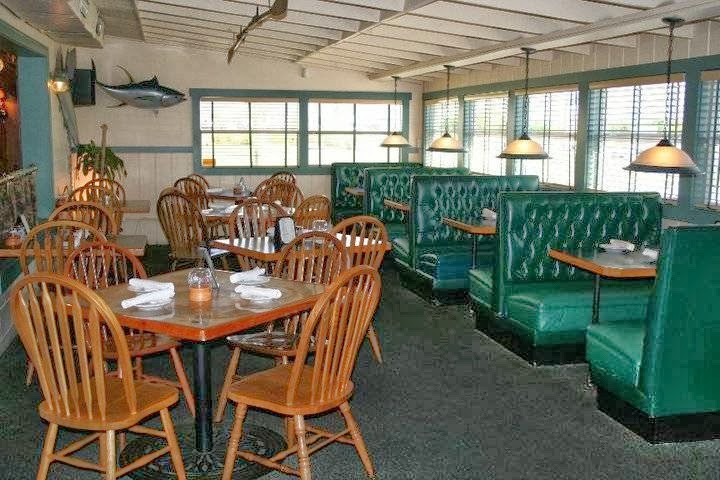 Pineda Crossing was born in 1996 from the remodeling of an old biker bar by Bob and Kathy Popp. The plain outside of the building conceals the ambiance and fine dining you will find inside. Remember the old saying "don't judge a book by its cover". The interior makes you feel welcome the moment you step inside. The walls and shelves are stacked with interesting artifacts including many hickory shafted golf clubs. The magnificent wooden bar is strategically located between the two dining rooms and is a nice place to relax while waiting for our table. They serve great drinks and the ambiance is comfortable and homey. Bob and Kathy take care of the management and hospitality, and their Chef and part owner is Rand Morgan, graduate of the CIA (Culinary Institute of America). He is arguably the best gourmet chef in Brevard County. Pineda Crossing is open for lunch and dinner, and the lunch crowd includes local business people including the staffs of nearby Florida Today and USA Today. You know it has to be good or these newspaper people would write bad things about it. The menu is incredibly diverse. It always features two or three fresh fish, steak and chop specials, along with some pasta dishes. These specials change nightly, and are in addition to their standard delicious seafood and steak offerings. My favorite dinners here include their fresh daily catch. I love their blackened grouper. I also like that most ethnic of American foods, fried chicken. One of their signature dishes is Chicken Augusta, a pan-fried chicken breast served with mashed sweet potatoes and vegetables and served with pecan-honey vinaigrette. They have wonderful large fresh salads, and many desserts including one of the best Key Lime pies in the State of Florida. This is such a special place for me that my sweetheart of long ago held a birthday party for me here, one of those "ending in zero" birthdays that could have been gloomy except for the great food and good company in this wonderful establishment.